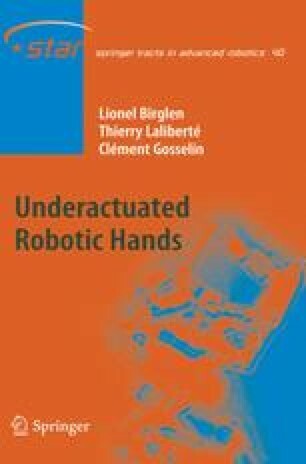 This book is an attempt to lay the fundamental bases for the use of underactuation in grasping robotic hands and to summarize more than a decade of research. It covers a broad spectrum ranging from the analysis of theoretical properties of underactuation in grasping to the actual design and control of prototypes. In the introduction of the book, a survey of current architectures of robotic hands was presented. Then, the principle of underactuation, i.e., using fewer actuators than DOFs, was presented as well as how it can be used to drive robotic hands. Several prototypes, some of them century-old, were pointed out from the literature. Although underactuation is a very old technique, it has only very recently attracted the attention of the research community. Beside this introductory survey, the first contribution of the book is the definition of two matrices—termed Jacobian and Transmission matrices—allowing immediate characterization of the force capabilities of a robotic finger. These matrices provide the analytical expressions of contact forces developed by a finger of arbitrary design and with any number of phalanges. The only limitation of the method presented is that abduction/adduction actuation should not participate in the grasp effort. Analyzing these matrices and the resulting contact forces expressions lead to considerations on equilibrium, and can also provide practical tools for the designer to compare between different solutions.